I love this book! Le’Taxione has written from the heart and spirit about three young women on a journey toward self-respect, deepening friendship, and a critical appraisal of popular culture. That these teen-agers care about each other is clear; more unusual are the steps they take to translate that caring into believing in themselves and each other. In our society, as women have learned to assert themselves in the workplace, the political arena, entertainment and sports, there have been increased counter-efforts to reduce them to little more than objects. Le’Taxione takes on the media (and those who benefit from it) by appealing directly to young women and their parents: don’t be fooled, he says, you are beautiful and capable; by helping each other you are stronger than the pressure of the media. At the heart of the book are a deep concern and a belief in the strength and wisdom of young girls on their way to becoming powerful, loving women. 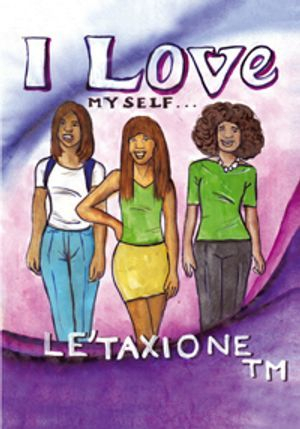 “I Love Myself” is written to address the trials and tribulations that young girls are faced with daily, in schools and in society. Though it’s not meant to be exhaustive, it touches on a wide range of topics in an attempt to inform and educate young girls about society’s impositions upon their lives and self concepts. My humble hopes are that this book can impart upon its readers, a sense of self worth and self awareness. I pray that this work will in some way help elevate the self concept of the young girls who read it, by making evident that our unique characteristics are not to be used to measure our worth or lack thereof; rather, they are merely distinctions that make evident our individual importance as a part of the collective whole. I pray that mothers and fathers use this book as a teaching tool and that it enhances their interpersonal relationship with their daughters.